Painted nero black laser cut metal masquerade mask, adorned with authentic Swarovski crystals this extravagantly designed and handcrafted Venetian ladies mask is just stunning. Turn heads for your fabulous style with this gorgeous Mon Amour Strass Filigree Masquerade Mask. This show stopping accessory is a stunning reflection of 'jet-set attitude', designed in an ultra-fashion-forward high quality metal. 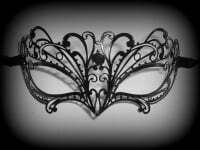 The crisp detailing, nero black finish and stunning Sworovski crystal adornments make it a cut above the cheap standard masks that are most frequently seen on the internet. 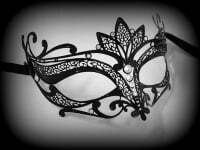 This mask featured in the Vampire Diaries TV series. 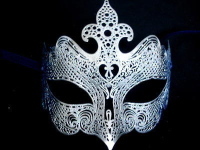 Make a luxurious fashion statement everywhere you go with this must-have filigree mask, guaranteed to get you noticed for all the right reason at your party.